The UK's only Bait Boat Specialists. This is the newer Boat from the very popular Waverunner Range of boats. Now being operated via 5.8ghz radio system appose to 2.4ghz meaning your now even more less likely to suffer from interference from other boats on the same water. 2 kilo capacity hopper load. E'D lights all round. Easy to use remote controller. Very quiet boat but yet fast. We believe this is a cracking mid sized bait boat. One of not many boats using Lithium technology gives the Waverunner Sport more power due to weight loss against lead acid batteries and Lithium batteries pack slightly more of a punch. Combining these and you'll clearly see the difference in performance on the water. Like all Waverunner bait boats, there is a rear line dropper which enables you to drop your rig separate from your main hopper baits. This is only a suggestion from us of course as you may also place your rig up in side the hopper on the Sport boat which will enable both your rig and baits to be dropped together. The right joy stock on the remote controls full movement of the sport whilst the left operates hopper drop and rear line drop. Lights operated from a switch on the remote. So what do you receive? 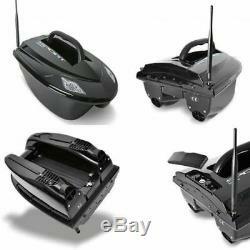 One pair of lithium boat batteries plus battery charger. 4 x Rechargeable AA batteries for remote plus charger. User guide all ready to go.. Spare batteries are available from our suppler of which you'll receive all their details with the boat. Standard and deluxe padded bags available (please see our other items). We're able to install the Toslon TF500 fish/feature finder to this boat (please see our other items). 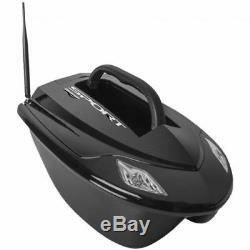 The item "Waverunner Sport Bait Boat 5.8ghz" is in sale since Wednesday, October 16, 2013. This item is in the category "Sporting Goods\Fishing\Anglers' Equipment\Bait Boats".ltd" and is located in Yelverton.